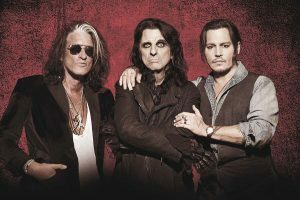 Hollywood Vampires is an American rock supergroup formed in 2015 by Alice Cooper, Johnny Depp and Joe Perry to honor the music of the rock stars who died from excess in the 1970s. The band name derives from The Hollywood Vampires, a celebrity drinking club formed by Cooper in the 1970s which included but was not limited to: John Lennon and Ringo Starr of The Beatles, Keith Moon of The Who, and Micky Dolenz of The Monkees. Touring members include or have included Duff McKagan and Matt Sorum of Guns ‚N Roses fame, as well as Robert DeLeo from Stone Temple Pilots.